I wish I could get through the summer season without reading about a pup or "hooman" kid who died because they were left in a hot car. Every. Single. Summer. It happens. I stumble on an article while scrolling through my news feed. Dog dies in hot car. Human kid dies in hot car. Why is this happening? Summer after summer after summer. As a dog mom, I can't even begin to understand this level of stupid. It's 85 degrees outside. You load Fido into the car, drive to your destination and what....? Leave Fido in the car? Doors locked? Windows shut? Walk away? Do you have any clue as to what happens while you're shopping or visiting or whatever and your fur-kid is left in the car? Any? They cook. Within minutes they suffer. They die. When the temperature is 85 degrees outside, it only takes about 30 minutes for the inside temperature to exceed 130 degrees. When the temperature outside reaches the 90's...well, you're looking at almost 150 degrees inside of the car. Even with the windows down, it's not enough. Running into the store and leaving your car running with the A/C on...I somewhat applaud your good intentions however, what if? What if the car stalled? What if there was a malfunction with your A/C. It happens. Too often, humans don't think of the unexpected. The unpredictable. Now they're coming out with devices to remind drivers there are passengers, both human and pup, in the backseat. This is right up there with kitchen gadgets like a banana slicer. If you can't slice a banana with a knife, stay out of the kitchen. 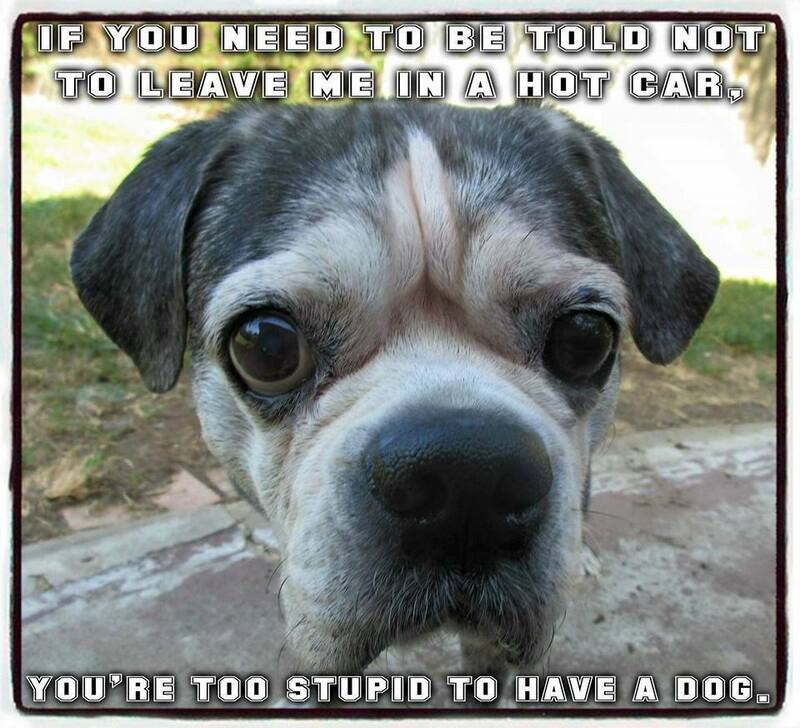 If you forget you have a pup or human kid in the car, you're too stupid to have a dog. Or a human kid. So, here's a thought. Leave your fur-kids at home if you're heading to a "no dogs allowed" destination. It's that simple. And, stop getting pissy about the humans who care enough to smash a window call law enforcement when you fall short in the area of parenting.